Jorhat (Assam): Empowered women are those who empower others towards success, and Joyshree Borah is one such woman. The 36-year-old mother of two from Tilikiam village in Jorhat, Assam, fought all challenges and emerged as a successful business entrepreneur by taking up vegetable farming and establishing nursery house, despite all odds and challenges. Her business has not only provided employment opportunities to many women but also gave them wings to be self-reliant and self-sufficient. Borah has set a perfect example for thousands of women folk, especially the victims of domestic violence, by taking up vegetable farming and by establishing her independent business. Joyshree, as a successful farmer, strictly follows a disciplined work culture and it has helped her build a successful career. “I am a farmer’s daughter and farming was my childhood dream. But in our society, women are always restricted from farming as it is always dominated by men. I also faced the same problem during farming but with all courage and guts I started my own nursery and since then I was self-dependent,” said Joyshree Borah. As a victim of domestic violence, Joyshree started a mission to fight for women’s empowerment and their rights and has encouraged women to take up farming and nursery for self-reliance. Joyshree had always dreamt of becoming a successful farmer and an independent entrepreneur. After completing her graduation from Jorhat College, she set up her own nursery in her village and later opened a flower shop in the heart of Jorhat city. Her business was flourishing rapidly and so were her earnings. While she had created a self-dependent and independent lifestyle, her situation changed after marriage as she became a victim of domestic violence. “In a male-dominated society, women don’t get a share and the earnings that are yielded from farming. However, they are always involved in farming equally with men but the earning goes in the hands of the man. After marriage, I faced the same problem and gradually when I start talking about my land rights to my in-laws I was denied of the rights by them as they said I am just their daughter in law and I don’t have any share. I was economically unstable and all my dreams and desires to establish a nursery were shattered at once,” Borah asserted. It was her sheer determination, grit and will, that enabled her to fight against all odds and fulfill her dreams. In 2015, she along with her husband and children walked out from her in-laws’ house and settled down in a rented accommodation in the Jorhat town area. She took up work in a private company and at the same time approached an NGO in Jorhat for setting up a nursery. 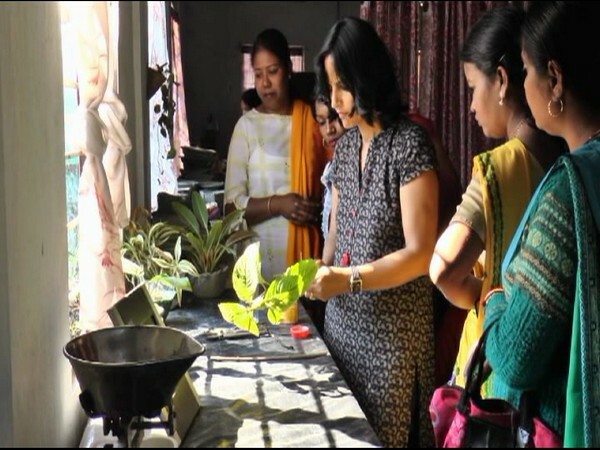 With the help from the philanthropic organisation and District Agricultural Department, Joyshree frequently organised free training program on vegetable farming, cut flower, Turmeric Nursery farming, Vermi Compost, etc, especially for victims of domestic violence. Around 15 women have participated in a daylong training program. Scientists from District Agricultural Department were invited for deliberation and for technical inputs. “I work in a nursery in my place. Here I get to learn many new things about biopesticides. Also learnt about the usage of organic products such as garlic, neem that can control pesticides. I had gone to learn about vermicompost as well as other things,” said Junmoni Saikia, one of the Trainees at the nursery. She even provides free saplings to those women who are economically weak to start their own nursery. Moreover, hundreds of women have become self-reliant by working under her nursery.